I'm too much of a purist to take apart a perfectly good 18th century garment. Horrors! But, since the woman who fashioned this vest did it, I have to admit that it is a beautiful thing. She must have looked wonderful in it, with a full skirt. A pity that style didn't last long enough for it to have gotten a lot of wear, but at least it still exists now, and I would totally rock a vest like that if I had it. Beautiful. I think that we have fewer men's clothes because the men wore them out or passed tem down to sons. Probably not the first time that a man's vest was repurposed for a female . I think it marvelous that we have any garments of the past at all. Any chance of these exhibits coming to Sarasota FL? Truly appalling that anyone in the 1950's would cut up such a valuable heirloom! After all, unlike the people who re-purposed fabric in earlier centuries, this seamstress had access to thousands of bolts of embroidered fabric. 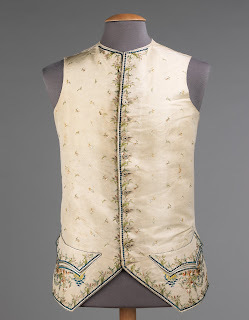 I own an 18th century waistcoat and have taken every precaution to guarantee that future generations will be able to admire it and learn from it. Kay Moser ~ I agree 100%! But until quite recently, historical clothing wasn't recognized and appreciated as it is now. Even the most respected museums and collections would permit people to try on original garments "for fun," and there are numerous photo shoots of 20thc debutantes preening and posing in now-almost-priceless 18thc and 19thc gowns. Although it makes me (and likely you) weep to consider it, 18thc clothing was routinely sold to 20thc decorators who would cut gowns and coats apart to make pillows and upholstery. This vest would date to around that period, and considering how so many other garments were completely destroyed, this is comparatively mild abuse. To me, the seamstress - and likely the woman who commissioned the vest - appreciated the workmanship in the original waistcoat, and tried to highlight it in their new version.